The oceans are filling up with plastic, and it's now getting to the point where human life is under threat. Baselworld isn't usually the place you go to hear about environmental issues (it's usually much more focused on luxury watches and shiny jewellery). This year, however, Oris is announcing a new partnership with Pacific Garbage Screening, an organisation that’s developing technology that will help keep the world’s water clean by capturing plastic before it enters the ocean. To highlight the partnership, Oris is also introducing the Clean Oceans Limited Edition, a bright, new version of the high-performance Aquis diver’s watch. It’s water-resistant to 30 bar (300 metres), and comes with a brilliant gradient blue dial and a uni-directional rotating bezel with an aqua blue ceramic insert, which symbolises "the beauty and importance of water". A further symbol of what the watch represents comes in the form of a medallion inserted in the case back. It's made of recycled PET plastic, but resembles a precious stone. Each of the 2,000 pieces produced will be unique, and are presented in special boxes made of environmentally friendly algae. 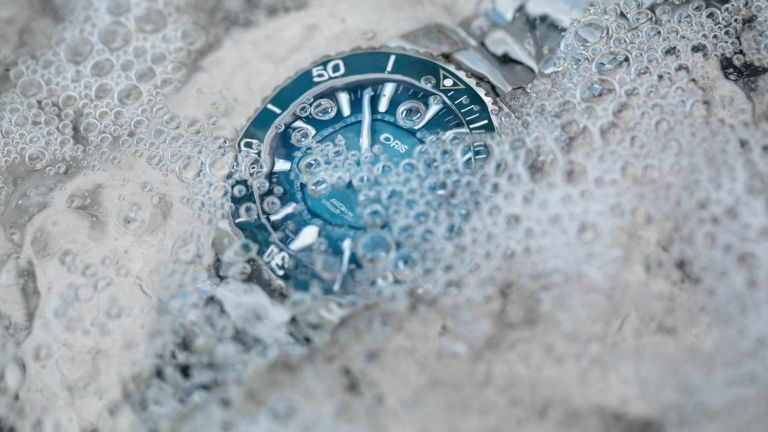 "The Oris Clean Oceans Limited Edition is a symbol of our commitment to ridding the world’s oceans of plastic," said Oris Joint Chief Executive Rolf Studer. "Oris continues to work with agencies for positive change, and we’re delighted to be working with Pacific Garbage Screening, whose innovative project will bring significant change for the better, in keeping with Oris’s mission."